Namibia is the 9th largest diamond producer in the world, by value. Namibia produces 95% gem quality diamonds. The strength of Namibia's diamonds lies in the high value stones, ranking 2nd globally by dollar per carat. Debmarine Namibia's annual production capacity is 1.4million carats. 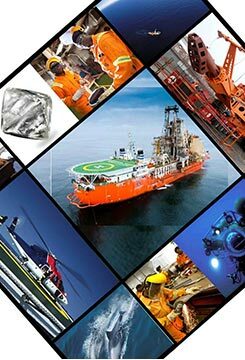 Debmarine Namibia is the largest producer of diamonds in Namibia, by value and volume. Debmarine Namibia accounts for around 70% of total diamond production in Namibia. The mv Mafuta is the world’s largest marine diamond mining vessel. The mv Mafuta accounts for over 50% of total Debmarine Namibia production. Wave swells in the Debmarine Namibia mining licence area can reach up to 10 metres. The biggest diamond produced by Debmarine Namibia was 80.3 carats. Debmarine Namibia Management has approved yet another long-term sponsorship agreement in the area of youth, particularly sports development.